Communities in Sindhuli, Nepal, affected by the World Bank-funded Khimti Dhalkebar Transmission Line (KDTL) have cause to celebrate. Since 2009, they have been raising their concerns about the health, safety and economic impacts of the project, and asking for adequate consultation, information disclosure, and mitigation of impacts. After a decade-long struggle, an independent facilitator was recently hired to moderate a dialogue between the affected communities and the government-owned project implementing agency, the Nepal Electricity Authority (NEA). The communities – consisting of indigenous peoples, Dalits, women and other marginalised groups – are hoping this process will help bring an amicable resolution to their concerns and some much-needed closure. This is a landmark moment both for the communities and for the Nepalese authorities. If the dialogue occurs, it will be one of the first times the government of Nepal engages in a collaborative dispute resolution process with communities affected by its development efforts. If conducted fairly and transparently, the facilitated dialogue can set a positive benchmark for community participation in Nepal’s growing power sector and help meet the government’s goal for just and sustainable development. The World Bank approved the project in 2003 and construction started in 2008. Soon after, in 2009, communities began asking for information about the project. They held peaceful protests, wrote letters to local authorities including the prime minister, and filed a case with Nepal’s Supreme Court. They also organised together as a ‘Struggle Committee’ and in 2013, filed a complaint with the World Bank’s accountability mechanism, the Inspection Panel (see Observer Spring 2014). These efforts resulted in a halt to project construction. Two years later, the Inspection Panel’s investigation report found that a number of the World Bank’s social and environmental safeguards had been violated, including crucial requirements to consult with local communities in good faith. The World Bank board responded by encouraging Bank management to amicably resolve outstanding issues. To put the board’s call into action, and address safeguard violations, communities asked World Bank management to help set up a fair and transparent dialogue process with the NEA (see Observer Autumn 2016, Spring 2016). However, despite community resistance and advocacy, construction moved ahead – through misinformation, police violence, and intimidation and coercion by local authorities. The project was completed in January 2017. During the 2017 Spring Meetings of the World Bank Group, Inspection Panel member Dr. El Bakri recounted there had been widespread misinformation about the project from the beginning, and “for a very long time, the people in that area thought that what the Bank was doing was putting up telephone lines”. There was no requisite buy-in from local communities and “quite a lot of violence”, she explained. The misinformation also caused serious delays and jeopardized the project. Now, with live high-voltage transmission wires operating over their homes, schools and crops, community members are, more than ever, concerned about the project’s health, safety and economic impacts. While several families refused to accept compensation as a sign of protest, even those who have accepted compensation remain concerned about the project’s unaddressed impacts. 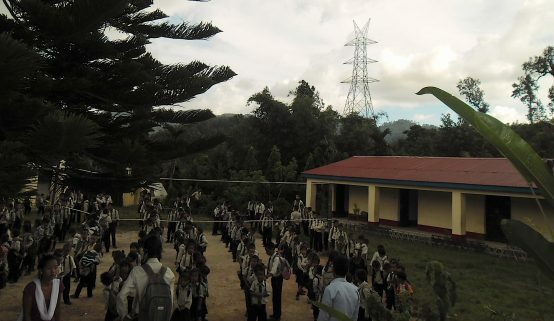 For example, some community members fear that children attending the Swiss Sindhuli school, which is disturbingly near a transmission tower and its looming wires above, will suffer health effects from electromagnetic radiation. Other community members have concerns about the safety of the transmission line after hearing reports of two children being electrocuted to death, struck by a different transmission line in another part of the country. Community members have repeatedly asked for the Swiss Sindhuli school to be relocated but this request is yet to be addressed. This facilitated dialogue presents the communities in Sindhuli with a chance to be heard, and have their questions answered in a respectful manner. Surendraswor Moktan, who is affected by the KDTL project said, “We are hopeful about the hiring of the facilitator. We want to participate in the government’s development activities and work together to achieve inclusive, sustainable, and human rights-friendly development by resolving our issues amicably.” Mr. Moktan is also chairperson of the local Struggle Committee of affected people, which is the representative organisation of communities in the dialogue process with the NEA. The NEA and the World Bank have to be commended for this precedent-setting step of appointing the facilitator. Now, the dialogue has to be set up for success, and each party has an important role to play. Good faith and commitment from all sides is essential for the success of this process. The World Bank is responsible for supervising and monitoring the dialogue, and ensuring it is adequately resourced. The NEA should engage community members with dignity and respect. And the facilitator’s task is to impartially consult with the parties to develop a dialogue process which will address power imbalances, and generate comprehensive time-bound solutions to address the Struggle Committee’s concerns. This dialogue can be a bellwether of Nepal’s long-term development. It holds significant potential to set a positive standard for community participation in development projects across the country. Nepal plans to grow its hydropower generation and transmission capacity with help from the World Bank and other international donors. The KDTL project has already precipitated other policy changes. For example, the government – with support from the World Bank – has set up a “Right of Way” task force to develop a much needed policy on securing land for transmission lines, including for other World Bank-funded projects. A fair, transparent and well-resourced dialogue process in Sindhuli will help inform the World Bank, the NEA and the Right of Way taskforce to develop best practices on the engagement of community voices. It will also set a positive benchmark for government agencies upholding Nepal’s commitment to just and sustainable development in accordance with its constitution, and international law and best practices such as the United Nations Declaration on the Rights of Indigenous Peoples and ILO Convention No. 169.